The iland cloud was designed with manageability and usability as primary goals. So, we built – and continue to invest in – our own industry-leading management console. The ease of managing your cloud determines your success with cloud – so, learn how the iland Secure Cloud Console delivers unsurpassed transparency, predictable costs, and easy access to our cloud capabilities – from network configuration to integrated backups. We collect and incorporate customer feedback continuously, and release new capabilities four times a year. This ensures you have access to the latest technology through the smoothest customer experience. iland Secure Cloud Console is currently supported on iland Secure CloudSM, iland Secure DRaaSSM with Zerto and iland Veeam Secure Cloud BackupSM environments. At your desk or on the go, control your cloud from any mobile device with the iland Cloud app. Designed with your business requirements in mind, the iland Secure Cloud Console is an intuitive, yet powerful interface that offers unmatched visibility and control into your cloud services at iland. It gives you the transparency needed to closely monitor and manage your cloud resources effectively in terms of cost, performance, regulatory compliance and support. It also provides the flexibility to customize permissions using enhanced Identity Access Management policies. The console was designed to keep costs under tight control in the iland cloud environment and avoid the runaway charges characteristic of many other cloud platforms. You can view costs at a granular level, from your virtual data center right down to an individual VM, and identify any waste caused by VM sprawl and zombie VMs. Create alerts for performance and cost criteria at the VM level for greater control of resource usage and to reduce the likelihood of an overage. And you can even predict your monthly vCloud services spend at a vDC, vApp and VM level. Managing your cloud resources becomes so much easier with the iland Secure Cloud Console. And it utilizes similar statistics to those in VMware vCenter so no new training or expertise is required to monitor your cloud. From every screen, full text searching enables rapid identification of workloads, enabling more efficient isolation of issues and resolution of problems. Through our easy-to-use wizard, you can modify power status and resource consumption on your VMs; and provision a new VM or vApp from either an iland public catalog or a private catalog built using vCloud. You can also leverage prebuilt iland templates and custom templates for rapid deployment of new environments. The ability to monitor resource utilization over time gives you extensive insight into how your cloud resources are performing and enables you to predict future spending. You want to ensure you’re getting maximum performance out of your resources. View performance statistics of your cloud services including real-time, last hour, last day, last week and last month. Track key activities, like added resources, with helpful tool-tips overlaying the performance graphs. Maximize performance by moving your resources from over-allocated VMs to VMs starving for resources, and do it all through a single pane of glass. Monitoring the performance of an application during development and test cycles increases your confidence that performance requirements will be met when the application is rolled out to production. Finally, export all the data behind our cost and performance graphs, whenever you need it. 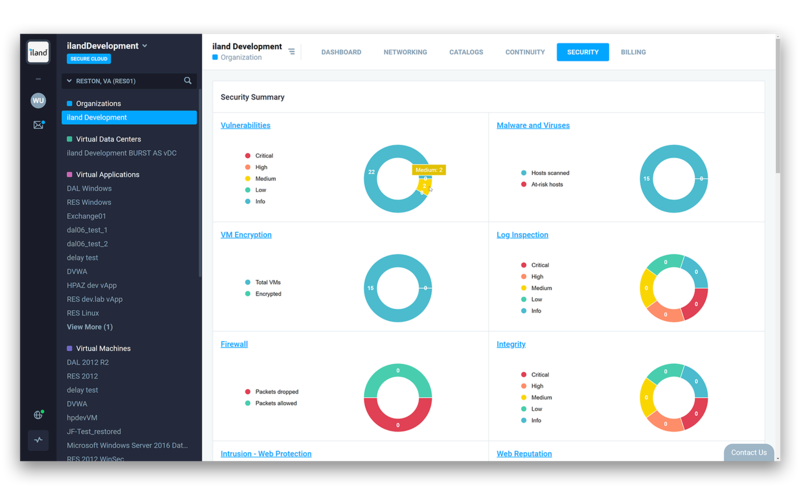 See into the security of your cloud with integrated, advanced security features, from vulnerability scanning to role-based access control to SSL-VPN. 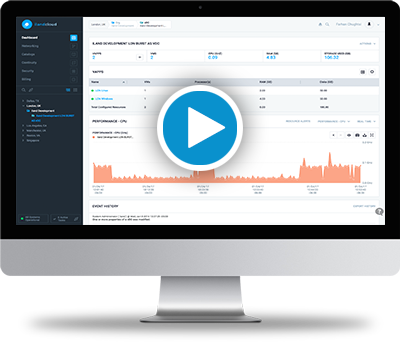 Configure the tools and view the reports on-demand within the console, ensuring your cloud and your workloads are always safe. For higher levels of security, our advanced security features also cover many of the requirements of compliant environments, like HIPAA. This includes encryption, intrusion detection, malware scanning and more – complete with the in-depth reporting within the console, customized security alerting and support from our compliance team to ease your path through an audit. Can you manage your IaaS footprint alongside your disaster recovery plan? In most clouds, you can’t. Within the iland Secure Cloud Console you can do both – manage your iland cloud footprint, as well as your on-premise-to-cloud and cloud-to-cloud disaster recovery. Zerto disaster recovery management is integrated within the console. Failover or failback your workloads with no iland intervention required, but rest assured our support team is available to help should you need it. Set RTOs of seconds or hours, depending on the tier of your application. 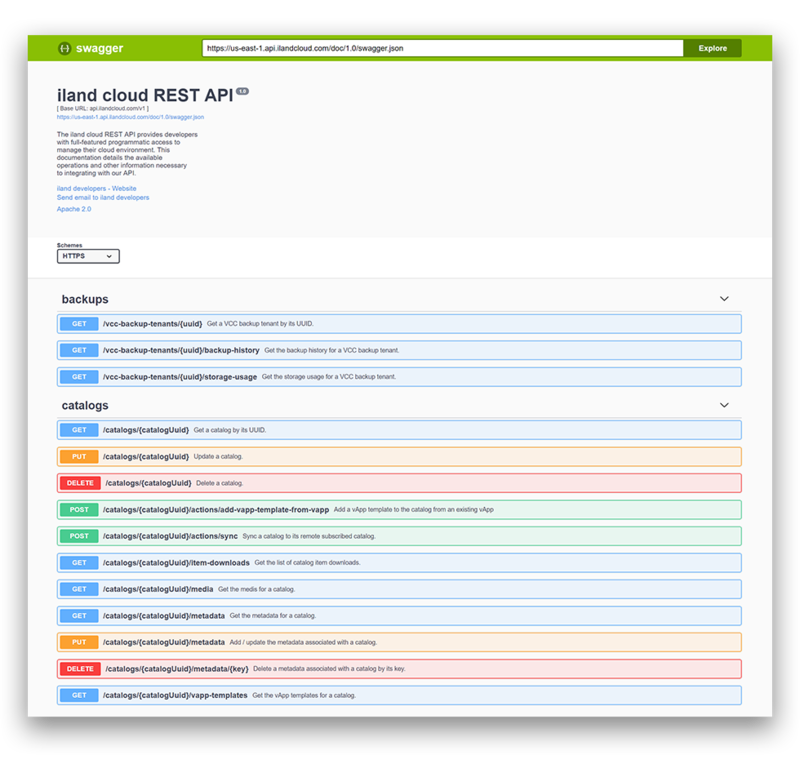 iland enables you to make API calls directly to iland’s console and cloud infrastructure – and access the enormous amount of performance, capacity, security and workload metadata we store. Configure dozens of machines at the same time – or import data directly into your NOC. The possibilities are limitless with our API and Java, Python, Golang and Erlang SDKs.